An abortive attempt to booze cruise my way through Norman France left me with an empty fridge and the question of what to eat. I should have been sitting in front of a mouth wateringly hot and cheesy galette, maybe with some added local ham, tan in colour and grainy in texture and served with sparkling locally made cider in an earthenware tea cup; bubbles complimenting the grainy crepe. However, the sea was too choppy for the ferry (a catamaran style, hence it not running) and I returned with an unchecked shopping list and a bag empty of duty free delights and French produce. The fact that Waitrose had an offer on their fish pie mix had nothing to do with it, not at all. I had the spring of the Easter bunny, the joys of Easter, the inspiration of the old tradition of fish on Friday, and what better day than Good Friday? I decided to tackle my very first Fish Pie (no, it really is my first time) and see how it goes. The mixed bag consisted of ivory white fish (Coley? I forgot to ask), bright golden smoked haddock, glistening salmon chunks in orange-red hues, and from the freezer, pale pink prawns, petit pois, and a further sliver of salmon asking to be used up. The rest came from a raid on the cupboards. 1lb potatoes (maybe a bit less) sliced to about ½ centimetre thickness. Mince the shallot and place in the bottom of a pan with the wine and bay leaf, boil for a few minutes then add the fish stock. To the liquid add the cut up pieces of fish and poach for about 5 minutes. Meanwhile, in separate jug, mix the egg yolks and cream together with the lemon juice, and season. 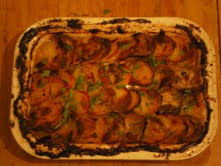 Drain the fish, returning the stock to the pan, and place in a deep sided gratin dish which has been buttered. The sauce is made by spooning about 2 tablespoons of the hot stock into the cream mix, then pouring the cream into the pan of hot stock, whisking constantly. This needs to boil until it is reduced to a double cream consistency (do not be afraid to let it really bubble). 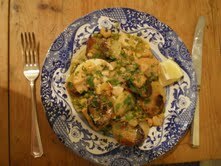 To the gratin dish of fish pieces, add the prawns, peas, some parsley the hard boiled eggs, mixing carefully. Pour over the thickened sauce and then place the potato slices on top (some will sink but it should settle) in a scale style. Place the dish on a baking tray to avoid the sauce bubbling over and bake at 180c for 45 minutes or until the potatoes are done. Serve with a sprinkle of parsley and some lemon wedges. So how did I fare? Well, not a bad first attempt, even though I say so myself. Any thoughts or tweaks? The sauce could have benefited from further reduction, and I only used half a lemon. It did have good flavour thanks to the stock and the egg cream thickening (rather than the cloying effect a roux can give). However, if there had not been smoked haddock in the mix, I might have thrown in a tiny frond of tarragon, a mellow aniseedy contrast to the lemony zing. I might have added a sharp saline kick of smoked bacon. There could have been potential to add anchovy essence, the sharp briney fishiness working well with the boiled eggs...if, if, if... If I had done that, perhaps I would be moving from fish pie to lily gilding.